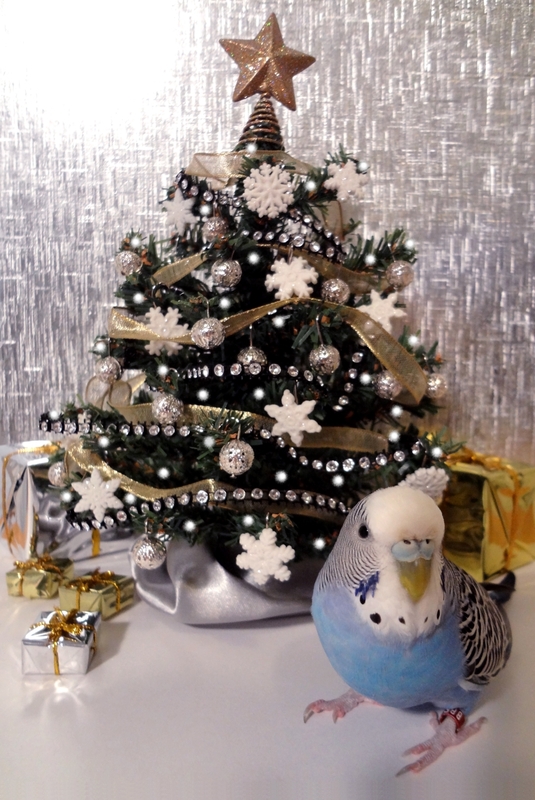 Posted on December 25, 2013 by Michelle M.
This entry was posted in Holiday Fun and tagged budgie, Christmas budgie, Christmas tree budgie, Cooper, holiday fun, parakeet by Michelle M.. Bookmark the permalink. Love you, Cooper and your family – you are a great present throughout the year!!! Merry Christmas Michelle, Harry, Cooper, Dewey, Ozzie, Sunny, Alfie and Emmy! PS. Miss Kauai looked in her stocking this morning–perfect timing–but bad mommy forgot to put her toy in the stocking! My budgies and lovebirds opened their presents and they loved them!! They got a lot of toys and millet. I got an iPad mini :3 In fact, I’m typing on it right now, while my budgies play with their new toy! MERRY CHRISTMAS!!!!!! Merry Christmas, Cooper! Merry Christmas and Happy Holidays to all the readers of Cooper’s Corner! Hope all the budgies and their families had a wonderful day and are enjoying their treats and toys! Hope you and the flock had a Merry Christmas! Happy New Year! Merry Christmas to you and Cooper and the flock! I’m a bit late, but have a Happy New Year 😀 lol … That little tree is cute, too.